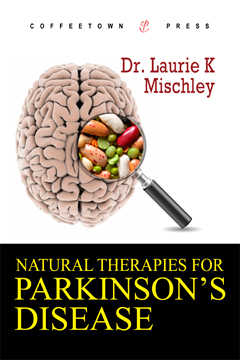 Coffeetown Press is proud to announce the publication of Natural Therapies for Parkinson’s Disease, by Dr. Laurie Mischley ($25.00, 6×9 Trade Paperback, 174 pages, ISBN: 978-1-60381-043-2). Approximately 1.5 million Americans have Parkinson’s disease, and more than 60% of them use nutritional supplements and alternative therapies. Patients and health care providers alike now have an easy-to-use, reliable, comprehensive resource for commonly used nutritional, naturopathic, and orthomolecular therapies. Many patients, who are only partially satisfied with conventional medicine, seek alternative and complementary options in an attempt to slow, stop, or reverse the disease process. It is a science-based reference manual. It is inspiring and empowering to patients. It is educational for both patients and neurologists. It fosters an understanding between conventional and complementary providers. Laurie K. Mischley, ND, runs her clinical practice, Seattle Integrative Medicine, in Seattle, WA. Her research at Bastyr University was on Glutathione in Parkinson’s disease.